Home » Blog » Lawyers take all to court. The team here at Duffy & Simon brought everything they had to court, playing off for the Pakenham Netball Association Senior Mixed Section 2 final against local team COBS on Wednesday the 3rd of April at Cardinia Life. The mixed netball team was made up by players of the law firm with many having a background playing in the local West Gippsland Netball and Football league. 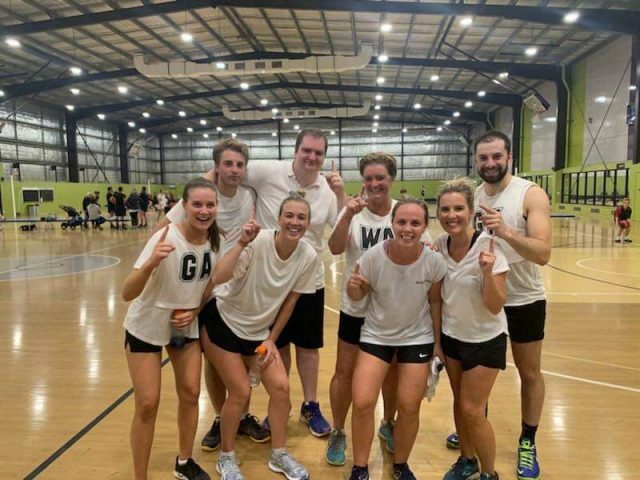 Duffy & Simon partner Sandra Keysers played a dangerous WA during the final, and Best on Ground receptionist Grace Cunningham said; “the Duffy & Simon netball team has attributed to a positive workplace culture and team environment within the firm”. The first half of the game was a close affair, with Duffy & Simon managing to get a break in the 3rd quarter, by creating many turn overs in the defensive end and mid court, which saw goalscorers Grace Cunningham and Robert Hall convert with great accuracy. On the night there was a great turn out from family, friends and co-workers with over 35 people attending to watch the victory on the night. Securing their first Pakenham Netball Association division 2 premiership over the COBS by 12 goals. Duffy & Simon Mixed Netball win premiership!